Prof. Jerzy R. Krzyzanowski. Gen. Leopold Okulicki: the Last C-i-C of the Home Army. 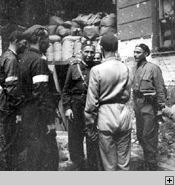 Prof. Krzyzanowski, a member of the underground Home Army in the German occupied Poland. In 1944, with the Red Army entering pre-WWII Poland's territory, he enlisted into the Soviet-controlled Polish Army. However, shortly afterwards he had been arrested by NKVD and incarcerated in an internment camp for the Home Army soldiers. Deported to the Soviet Union in 1945, spent more than two years in a number of gulags. He emigrated to the United States in 1959, where he taught Polish literature at various universities. Currently he is a Professor Emeritus of the Ohio State University. Leopold Okulicki [pronounce: Okulitski] was born on November 12, 1898 in Okulice, a small village in the Cracow region. As a young boy he joined Jozef Pilsudski’s legions at the outbreak of World War I, and served with distinction until its end. During the Polish-Soviet war of 1919-1920 he received his commission and was decorated for bravery with the highest Polish military order Virtuti Militari [ medals ]. He decided to stay in the army, and during the interwar period served at various units until 1935, when he was transferred to the General Staff in Warsaw. Promoted to the rank of lieutenant-colonel he eventually became deputy to the chief of Department III in the General Staff, responsible for maintaining liaisons with field staff officers. In that capacity he was just about the first staff officer to learn about the beginning of World War II hostilities on the Polish-German border. During the siege of Warsaw in September 1939 he did not leave with the General Staff but stayed in the Polish capital, at his own request commanding a small task force of three infantry battalions, counter-attacking the German offensive. 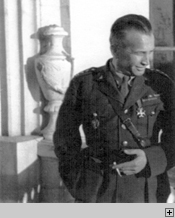 After the end of the campaign he was among the first officers to join a newly organized resistance organization Sluzba Zwyciestwu Polski (Service to Poland’s Victory), later re-named Zwiazek Walki Zbrojnej (Union of the Armed Struggle) and eventually, in 1942, Armia Krajowa (Home Army). Initially commanding the Lodz region in central Poland, he was ordered to assume the command of the entire south-east territory, occupied by the Soviets. Arriving the Lvov in October 1940 he tried to re-organize Polish resistance groups there, not knowing that the entire movement had been penetrated by the Soviet secret police. Soon he was arrested in January 1941, interrogated and moved to Moscow where he was fortunate enough to live to the outbreak of German-Soviet war which in turn resulted in the Polish-Soviet agreement freeing political prisoners who formed a new Polish army commanded by General Wladyslaw Anders. Okulicki became its chief of staff. When the army was transferred to the southern Russia, General Anders decided to transfer Okulicki, who was always at odds with the Russian officers attached to the staff, to the newly-formed 7th Infantry Division as its C-i-C. Together with his troops he left for Persia and Iraq, but training and waiting did not agree with his energetic character. As soon as a new possibility emerged, he asked to join newly organized special commandos who were to be parachuted to occupied Poland as instructors and specialists in clandestine fighting. Initially appointed a commander of an air base in Italy where from the Polish aircraft flew missions to Poland, he soon underwent a special training, and was parachuted into Poland in May 1944. Arriving secretly in Warsaw, with a promotion to the rank of a General, he was given a post of a deputy to the chief of staff and and operation chief of Home Army High Command, but due to an illness he was not actively involved in its operations until July 1944, when major political and military decisions were to be made. A rapid progress of the Soviet Red Army offensive toward Polish capital, weakening German defenses, and the general enthusiasm of the Polish freedom fighters contributed to a dramatic decision to call for the outbreak of an uprising in Warsaw. Okulicki (pseudonym 'Kobra') was among the most outspoken advocates of the open uprising, and his opinion, as a person with a vast military experience, a recent command in the West, and a special mission from General Kazimierz Sosnkowski, the Supreme Commander of all Polish forces, carried a great authority to be reckoned with. 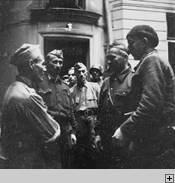 During the last fateful meeting of the Home Army High Command on July 31, Okulicki did cast a decisive vote to start an uprising on August 1. Ironically, his initial role during the battle was to be passive. General Tadeusz Komorowski 'Bor', who commanded the Home Army, designated Okulicki to stay put as a future C-i-C of a new, anti-Soviet resistance organization NIE (short for Niepodleglosc – Independence, and, at the same time, a protest call Nie – NO! in Polish)., to be activated in case of the Soviet occupation. Only in mid-September, when the chief of staff, General Tadeusz Pelczynski had been wounded, Okulicki assumed his duties and served in that capacity to the end of the uprising in October 1944. And when General Komorowski became a German POW, he nominated Okulicki to be the new C-i-C of the Home Army. The legend of the heroic General 'Niedzwiadek' ('Bear Cub') w	as about to begin. Deeply involved in the underground activities of the leadership of the clandestine State structures he resented any attempts to communicate with the Soviets whom he knew too well to trust their promises. Only when directly ordered by the Deputy Prime Minister Stanislaw Jankowski, he agreed to accept a Soviet invitation to negotiations concerning Poland’s future. He went to those talks on March 27, 1945 fully aware that he might be walking into a trap. And he was right. As soon as the Soviets gathered together 16 political leaders of free Poland, they arrested them and kidnapping them deported by plane to Moscow. After long and torturous investigations they staged an open show-case trail on June 18-21, 1945. All sixteen Polish leaders were accused of organizing anti-Soviet activities, sabotage and terror directed against the Red Army, crimes which according to the Soviet law carried heavy penalties. The defendants were given Soviet lawyers who sided with the prosecution rather than defending their clients. Top Soviet prosecutors launched a barrage of indictments and demanded merciless punishments for the alleged crimes. In their last word the defendants were able to speak up, and Okulicki distinguished himself with a courageous and proud speech delivered in Russian. He cited the patriotic character of the Polish resistance and the Home Army in particular, listed many of its achievements fighting the Germans, and categorically denied any accusations of collaboration with the Nazis. "This process", he said, "has a political character […] Mr. Prosecutor, referring to the testimony given by my colleague Mr. Bien, declared me to be an adventurer responsible for t	he Warsaw Uprising. Yes, I admit, I took a major part in leading the Uprising but I am not an adventurer. The Warsaw Uprising, I believe, was not an adventure […] I fulfilled my patriotic duty as a soldier acting according with orders given by my government. Now you, gentlemen judges, do your duty according to you conscience, your honor.” After some deliberations the court convicted Okulicki and sentenced him to ten years imprisonment. He left the court walking erect, smiling. Details of the one-and-a-half year he spent in a number of Moscow prisons are sketchy since he was kept in solitary confinement. Only years later some documents emerged pointing out to his attempt to write a political memorandum addressed to Stalin, his hunger strikes, and his ill health which eventually resulted in an acute case of twisted bowels necessitating in a surgery procedure leading to his death in a prison hospital on December 24, 1946. Two days later his body was cremated, and the ashes dumped into a common grave No. 3 at the Donskoy Cemetery in Moscow. Polish authorities were able to put a commemorative plaque there only in 1994. The memorials to Okulicki were made initially in England where the soldiers of free Poland commemorated him on several occasions while his former subordinates in Poland started similar ceremonies as early as 1978. The President of the United States Donald Reagan awarded Okulicki, Komorowski and Stefan Rowecki (the first C-i-C of the Home Army) the highest American decoration, The Legion of Merit, in 1981. The next decade, when Poland has become a free country again, saw many attempts to keep the memories of the last C-i-C of the Home Army alive: monuments were erected, publications, films and video clips made, and finally there was organized a symbolic funeral of his ashes collected in Moscow and buried in Warsaw in 1991. His name has been permanently displayed on a Home Army Monument erected in Warsaw in 1999 and blessed personally by John Paul II. Thus the story of Leopold Okulicki has become an integral part of Poland’s history. Gen. Okulicki photograph from Buzuluk, Soviet Union, 1942, provided by his adjutant Jan Romanowski. General's unique Warsaw Uprising photographs were taken and provided by Dr. Jerzy Einhorn. Originally published in: Einhorn, Jerzy. Wspomnienia z Konca Epoki. PFK. London, 2000. © Copyright Jerzy R. Krzyzanowski. All rights reserved.